Home / Blog / Does Repeating a Grammar Error Often Enough Make It Right? Today’s blog post is my response to a question asked by Facebook friend LC. It’s a common question, and I wanted to provide a thorough answer so I can refer others to it when they ask the same. By the way, if you don’t follow me on Facebook, you should. We have a lively community of grammar/writing fans. Check it out at http://facebook.com/WriteAtHome. …at what point do you defend standard English rather than adapt to a mistake that is commonly made? At what point, for example, would alot become standard? An excellent and common question. Actually, few people in my experience ask it as a question. It usually comes at me as an impassioned statement instead: Just because people make the same mistake all the time doesn’t make it right. I usually respond with something like, “What does make it right?” I can’t remember ever getting an answer to that one. But do you see how important that question is? I’m happy you used the word standard instead of right or correct. It’s more precise. But it also provides the answer to your question. We accept as standard a usage that has become standard. English has no official governing board like some other languages do. It never has. When Samuel Johnson wrote his great dictionary, he assumed a large degree of authority, and as a literary luminary, he was readily granted it. He was, in fact, contracted by local booksellers to write it in the first place. It was considered the authority on English until the first OED was completed in 1928. Other dictionaries were written in the meantime too, along with books on grammar. They were written by scholars and groups of scholars. In the 1800s in particular there was a lot of prescription going on — scholars and other authorities insisting on certain rules for a variety of reasons, often to make English conform to the rules of Latin. They didn’t all agree with each other of course, but some of their prescriptions, for whatever reason, gained acceptance and began to be enforced by schoolteachers who have passed down those same arbitrary usage laws for generations. 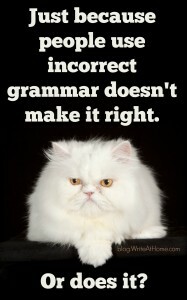 For the most part, these rules are those considered sacrosanct among grammar sticklers. They include never ending sentences with prepositions or beginning them with conjunctions, never splitting infinitives, and drawing sharp distinctions between less and fewer, further and farther, continual and continuous, etc. But who were these grammar rule makers and why should their utterances a century and a half ago still hold sway today? There’s absolutely no good reason. Today dictionary makers and linguists don’t think of themselves as rule makers. They think of themselves as observers and describers of language as it is actually used. They are still the gate-keepers of English, mind you. And they are that because we speakers of English look to them for this. But they are a broad and loosely-defined group. They include textbook publishers, teachers, editors, writers, style guide and handbook publishers, and, of course, dictionary makers. There are multiple competing dictionaries who convene boards every few years to remove obsolete words and add new ones. How they go about doing this is fascinating, but it is based largely upon actual usage data over time. There is still subjectivity, but it is no longer a matter of merely scholarly preference. The primary question is: Is this word or this usage now common enough for us to recognize it in our dictionary? New words and new definitions of old words have to not only have entered the mainstream, but must have proven to have some staying power. Dictionaries added controversial new words like defriend and flash mob in 2013 not because in their power and authority they decided to magically grant these words official status, but because observation of print and web publications showed that they were in such frequent use that to leave them out of the dictionary would make the dictionary less useful. I mean, if grandma keeps seeing the word mouseover and wants to look it up, she should be able to find it if the dictionary is any good. So, dictionaries and linguists in general do not dictate correctness. They recognize what has become standard. And they do it not by monolithic decree, but by general consensus over time. That’s what keeps the language from spinning out of control. That’s why da bomb never made it into any dictionaries, for example. It was a craze for a short time, but soon faded like the cat’s pajamas and peachy keen. So, when will alot be acceptable? When and if English speakers and writers use it enough to warrant its acceptance as standard. For the record, there is little fear of that. A quick look at Google’s Ngram Viewer shows an increase in the published appearance of a lot, but a flat line that shows an almost complete absence of alot in published works. For the record, lots of words that we use every day were formed by mistakes. Words even the strictest grammar snobs use without a second thought were once vehemently opposed by their ilk of a previous generation. What I find endlessly interesting about English is how it changes. People tend to think of it as devolving, but I think that’s silly and baseless. The English of Chaucer could be beautiful. Same goes for the King James of Shakespeare. The verbose and complex eloquence of Victorian English has its charms, but so does the poetry of the 1920s, the prose of 20th century novelists, right up to the present day. The English of John Milton was different from the English of T.S. Eliot, Robert Frost, or William Faulker, but was it better? More powerful or beautiful? It’s a matter of opinion, surely, but I don’t think so. And you can see in the writers of just about every era a similar tendency to bewail the passing age of purity and profundity and the sad acceptance of crass and lazy grammar. I say nonsense. If English is still spoken by human beings in a hundred years, they will be complaining that no one writes anymore like Annie Dillard, Philip Roth, Cormac McCarthy or (pick your favorite contemporary writer). That’s probably more than you bargained for, LC. But it’s something I wanted to get down. I get asked this question in one form or another often enough, that I wanted a fairly thorough answer to point people to. I am always eager to hear your comments. Please leave them below. Grammar is one thing… but punctuation is another. I sure do not believe that repeating punctuation errors long enough will make them right, and I don’t think you do either. Correct? Shakespeare was famously inconsistent in his use of punctuation, as was Chaucer and other writers before him. There was no clearly communicated standard of correct punctuation use in their days, so folks used the marks as they saw fit. Which means, just like all other aspects of grammar and written English, the rules governing punctuation marks have evolved somewhat over time. The good news for folks concerned about English devolving into chaotic anarchy is that just the opposite has actually happened. We’ve all congenially settled on a pretty thorough and rather agreeable set of rules for using punctuation. Another thing that keeps punctuation from changes as much as other facets of grammar is that punctuation is only a written element of the language. We don’t use punctuation when we speak like we do diction and common usage. And it’s in spoken English, which is less tightly guarded than written English, that popular changes to the language begin. So, punctuation rules are the same. They have changed over time. They are likely to continue to change, though slowly. And whatever changes do occur will come as the result of how people actually write.